Accolo, Inc. ®, the leading Elevated RPO™ solution company, today announced that an unprecedented number of applicants for jobs are coming from social networking sites like LinkedIn and Facebook. In fact, the growth of applicants from LinkedIn alone has increased by over 466% over the last quarter. 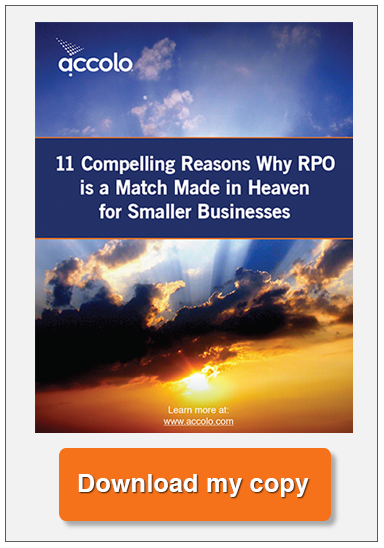 This data is based upon Accolo’s unique insights into applicant source information across hundreds of companies and tens of thousands of jobs via its Elevated RPO™ Platform. Accolo’s Elevated RPO™ platform actively monitors and identifies the most effective candidate sources across all available talent pools. Based on current trends, it is highly likely that social networks will surpass even the largest job boards as the primary source of hires within 36 to 48 months. Accolo is the leading Elevated RPO™ solution, including a patented SaaS Elevated RPO™ Platform with embedded social network job distribution, a collective intelligence Hiring Knowledgebase™ enabling a data driven recruit-to-hire process coupled with on-demand recruiting capacity via a network of Accolo Certified Hiring Consultants with the most relevant industry, functional and geographic experience as measured by hiring manager scoring and hiring performance metrics. 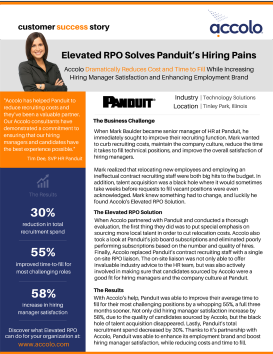 Companies use Accolo’s Elevated RPO™ solutions to materially increase the productivity of their internal recruiting process, while being able to scale recruiting capacity on-demand or they leverage Accolo as their turn-key internal recruiting department. Accolo is acknowledged as the leading On-demand Recruitment Process Outsourcer (RPO) and is a founding member of the Recruitment Process Outsourcing Association. For more information, visit www.accolo.com. Accolo Launches Unique Business Model for Revolutionizing Hiring Process, Company Uses Social Network-Based Recruiting Solution to Solve Everyday Business Problem.